CHICAGO (AP) In a story Dec. 15 about Yonder Alonso's trade to the Chicago White Sox, The Associated Press reported erroneously that Alonso is married to the sister of star slugger Manny Machado. Machado is married to Alonso's sister. 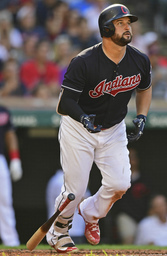 CHICAGO (AP) - First baseman Yonder Alonso was traded to the Chicago White Sox by the Cleveland Indians on Friday in a deal between AL Central rivals that could have broad implications for both teams the rest of the offseason.